The Ancient Minoans used three known forms of writing. The first was a hieroglyphic script that was used mainly during the period from 2000 BC - 1580 BC. This style of writing was basically pictures or symbols used to represent concepts, ideas, and possibly syllables. Evidence of this script has been found in fair abundance at the palaces of Knossos and Phaestos. Currently, there is no key to reading Minoan hieroglyphic writing. If we can learn to read it, we will no doubt learn much more about the culture of the Ancient Minoans. The second of the Minoan scripts is called Linear Script A. Writing in Script A is believed to be a shorthand verson of the hieroglyphic script written in linear form. By the 1500s BC, this script was in use throughout Minoan controlled areas of the Mediterranean. 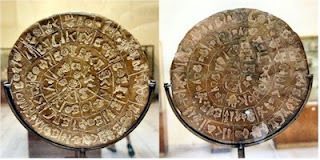 We are not yet able to read Minoan Script A. Linear Script B, dated to around 1450 BC, is the last of the Minoan styles of writing. 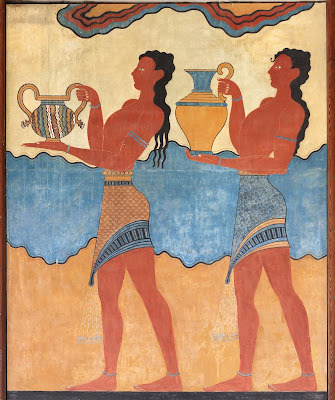 It was found only in the area of the Minoan capital of Knossos on Crete. We can read Script B because it is basically Ancient Greek. Being that the Mycenaeans on the mainland of Greece spoke Greek, the presence of Linear Script B on Crete suggests that the Mycenaens may have already conquered and/or migrated to Knossos by this time.